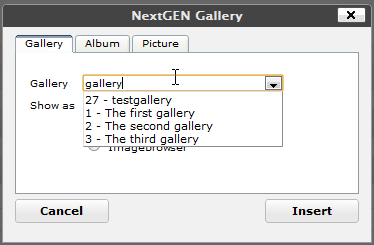 Today I’m focused on NextGEN-Gallery , which is a real challenge for me. It has a large user base and is used in various way. I spend a lot of time for the upgrade process, so that a new version (hopefully) will not break your work. It’s real easy to write a new plugin, but when you have a lot of user, every single line needs to be reviewed. This makes the develeopment for my plugin so hard, I’m really no professional programmer, I never used or tested my work on high traffic blogs, never worked with large multi site environment, nexer used more than 1000 images. So instead of adding more and more features, I will work in the next time just on scalability and UI. Some time ago I ask how many images you have uploaded with NextGEN Gallery, and I’m really impressed about your response. But sadly this amount of images shows the current limits of my plugin. I never thought in this amount, so I programmed some features which are good for a couple of image/galleries, but not for hundreds of them. One big flaw is the TinyMCE Dialog window. You can select in the WYSIWYG Editor easily a image or gallery from the drop down field and insert the shortcode, but it’s a mess if you have 10000+ images. One first improvement is part of the upcoming V1.7.0 : Auto complete for drop down fields. With the help of jQuery UI Autocomplete, you can select one of the last 50 images or you can search for any image and select then the desired image. There are more places in the admin back end which need as well a full rework (i.e. Album management) but I just would like to get first your feedback on this new feature. I finished the first beta of V1.7.0 and it would be great if some of you can test this version. I’m already upgraded my test blog & live system, so it should be stable enough to give it a shot. Let me know here in the comment section if you have any problem, or feel free to open a issue at my Google Page. Thanks !